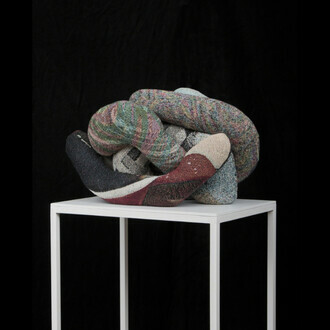 Geary is pleased to present The Sentinels, an exhibition of sculpture and video by Rachel Frank and Heidi Lau. The Sentinels centers around Frank and Lau’s unique perspectives and placement in the shifting landscapes, literally and metaphorically, of time and history. Sentinels, or guardians, present themselves in several iterations throughout the exhibition: first, with Lau’s gargantuan ceramic serpent, "The Primordial Molder", at the front of the gallery. 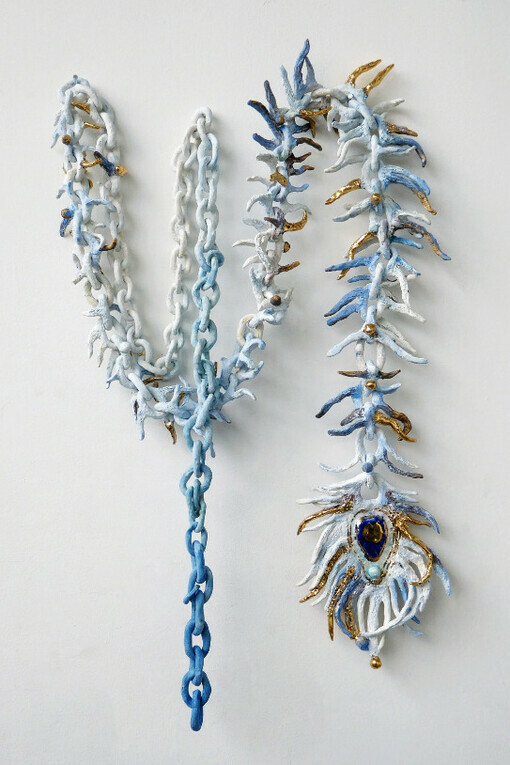 Initially installed at the Terrace of the Bronx Museum for the Arts, this hand-built ceramic presence is at once an unyielding serpent entity and a craggy, flowing landscape. The appearance of disembodied pairs of ghostly hands in both Lau’s ceramic wall installation and video in the rear gallery suggest a disjointed past that’s been ruptured and augmented. 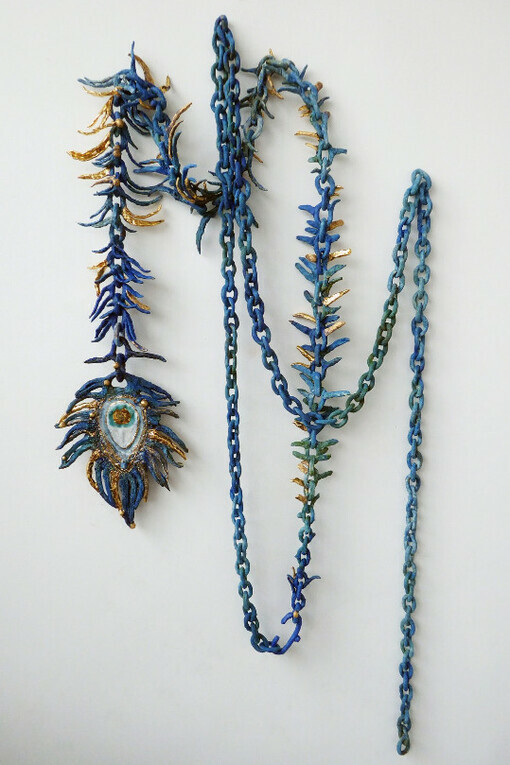 Her ceramic chains incorporate a peacock feather pattern. 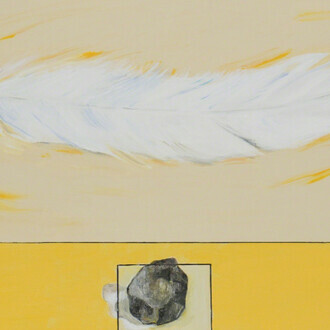 Referencing the ancient Greek belief that the flesh of a peacock never decays after death and their feather ‘eyes’ are always watchful, this piece creates a link between the physical and the spectral. 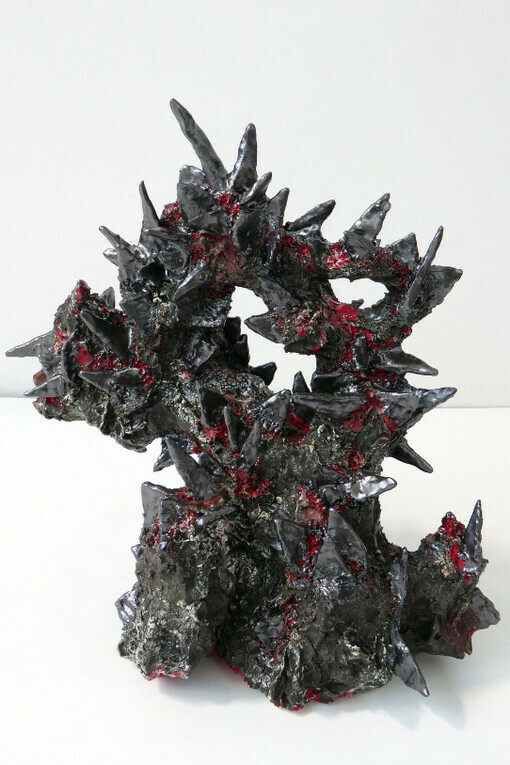 Throughout the gallery Lau’s ceramic series, "Mountain of Knives”, creates a topographic installation referencing one of the 18 levels in Taoist hell. The adjacent wall is adorned with Frank’s heavily hand-beaded “Pattern for a Yurt” panels. Yurts, traditionally felted nomadic dwellings originating in central Eurasia, are another stand-in for the sentinel as a protector from the elements. Only a pattern, not yet a structure, Frank’s beaded pieces suggest an abstracted possibility for transformative shelters needed during times of upheaval – looking to a future that links the past. Her ceramic rhyton vessels are based on ancient Eurasian clay vessels that mimicked animal shapes and held liquids for use in ritualistic ceremonies to influence the gods: installed in a herd, they retain their sculptural quality, and appear again in the artist’s video, rhythmically being filled and drained against the ebb and flow of tides responding to rising sea levels. 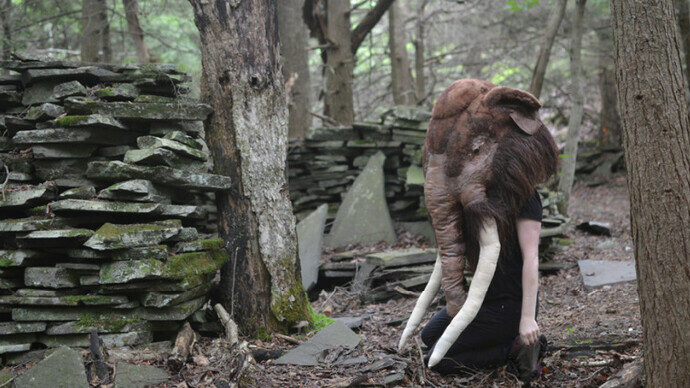 Filmed alongside an extinct woolly mammoth speaking in fragmented monologue, the video uses an expansive vision of time to examine the historical ways man divined the future and sought influence over natural processes. Together, Frank and Lau suggest the stark reality of an uncertain future informed by the materiality of the past. While examining abject evidence of human kind’s trajectory, the two artists also offer a respite in The Sentinels: disaster and chaos, in the form of rapid expansion and collapse, are countered by guardians who watch over our real and mythological worlds as soothsayers: reforming the future by interpreting the past. Hieidi Lau was raised in Macau and currently works in Brooklyn. She has been featured in exhibitions nationally and internationally in venues such as the Bronx Museum, Macao Museum of Art, Museum of Chinese in America (New York, NY), Wave Hill (Bronx, NY), Kniznick Gallery at Brandeis University and Real Art Ways (Hartford, CT). 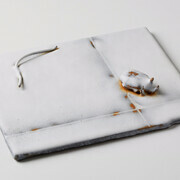 She has received numerous residencies and awards, including the Joan Mitchell Foundation Painters and Sculptors Grant, Emerging Artist Fellowship at Socrates Sculpture Park, Center for Book Arts Workspace Residency, Lower Manhattan Cultural Council Process Space and BRIC Media Arts Fellowship, among others. She completed the Bronx Museum’s Artist in the Marketplace (AIM) program in 2011 and was an artist-in-residence at the Museum of Art and Design Artist Studios in 2017. 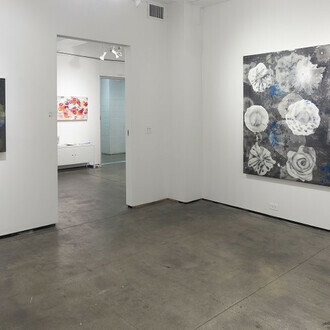 Lau's work was exhibited by Geary in a solo presentation at NADA New York in March 2018 where she was the recipient of the NADA Acquisition Gift for BxMA (Bronx Museum of the Arts). She also participated in Spring Break Art Fair 2017 and 2018. In 2018 Lau will be an artist-in-residence at The Joan Mitchell Foundation in New Orleans, as well as at St. John's Pottery in Minnesota, made possible by the Jerome Foundation. Rachel Frank grew up near Big Bone Lick, Kentucky, the birthplace of American paleontology, where large mammoth and other megafauna fossils were found, altering Western views on extinction and evolution. 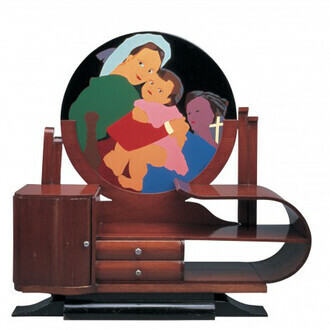 Frank received her BFA from The Kansas City Art Institute and her MFA from The University of Pennsylvania. 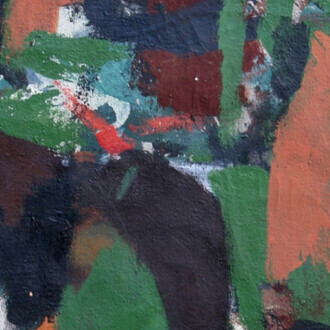 She is the recipient of grants from The Pollock-Krasner Foundation, The Elizabeth Greenshields Foundation, The Puffin Foundation, and Franklin Furnace Archive. She has attended residencies at Yaddo, The Marie Walsh Sharpe Foundation, The Museum of Arts and Design, the Innoko National Wildlife Refuge in western Alaska, and The Skowhegan School of Painting and Sculpture. Her performance pieces have been shown at HERE, Socrates Sculpture Park, The Select Fair, and The Bushwick Starr in New York City, The Marran Theater at Lesley University, and most recently at The Watermill Center in collaboration with Robert Wilson. 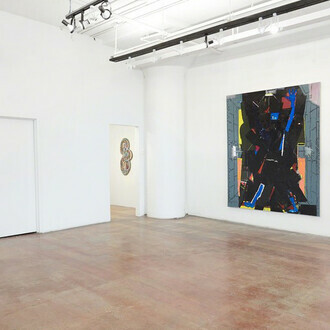 Recent solo shows include the SPRING/BREAK Art Show and Thomas Hunter Projects at Hunter College—both in New York City in 2017—and at Standard Space in Sharon, CT in 2018. She has a 2018 residency at the Museum of Contemporary Art in Tucson, AZ, where she will be exploring the intersection of wildlife, wildlife corridors, borders, and drought in the borderlands region of the southern Arizona Sonoran Desert. 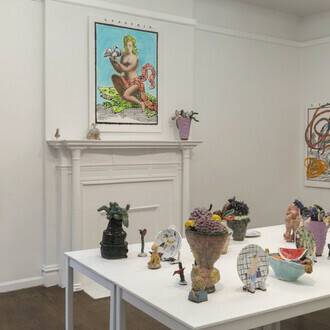 The gallery represents emerging and mid-career artists working in a variety of media, with an emphasis on those from New York City and the Midwest. 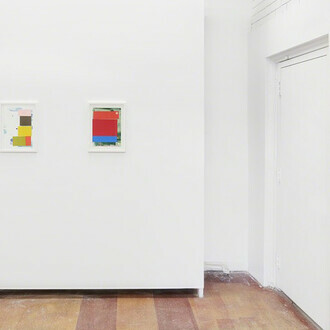 Geary presents solo, two-person, and group exhibitions, and seeks to raise artist profiles and exposure through placement in museum collections and exhibitions, and through presentations at art fairs.